Please note, this guide applies to students paying the CONNECT Fee. Only students enrolled in certain programs may receive a loaned computer. Your eligibility will be verified when you come to the IT Service Desk. Phone number of the student. Email account (Not their Fanshawe email). The date the laptop is returned. If it’s a complete return (Checkmark if complete, X if missing items. 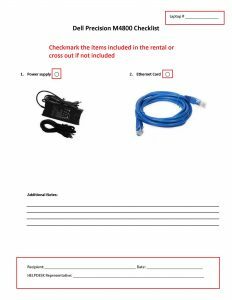 If items are missing note which items are missing (power cored, adapters). Green – It’s important that the student signing out the laptop reads this section, especially so the parts that are underlined. The reverse of the contract is to note damages or missing items when the laptop is returned. If the returned laptop is in satisfactory condition, this page will be blank. Notes: Please write, in detail, any damages you see, ie. Dent on left half of case, missing power adapter, broken display. These pages are just as important as the main contract. Every dent or scratch must be noted to avoid repair fees. 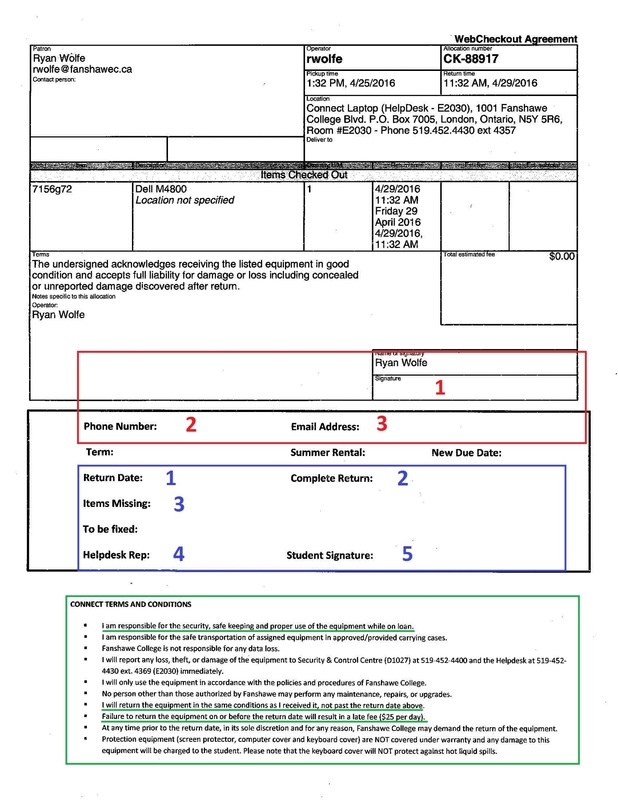 Damages not reported on the form upon return will be assumed as student damage. It is imperative that students look over the laptops carefully. The IT Service Desk will also look over the devices before signing them out as well to make sure there are no major problems. 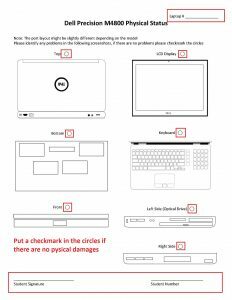 If we do spot something, we will point it out to the student, however it is the student’s responsibility to go over every part of the laptop and make note of damages. 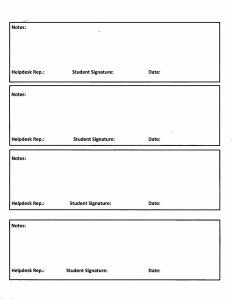 If there are no damages to the section being reviewed then there must be a checkmark next the title or the picture to signify that the student has looked over each section and confirmed that there are no physical damages. There are a lot of steps to signing out the laptops. Do not rush when going through the process, every step is important. Depending on the situation of which the laptop is being loaned, the ITSD can, upon its sole discretion, extend the laptop loan. In order to do so the student must provide proof the system is still in repair if being done by a 3rd party. Every page must have the laptop number (service tag) at the top of the sheet (Both sides if double-sided). 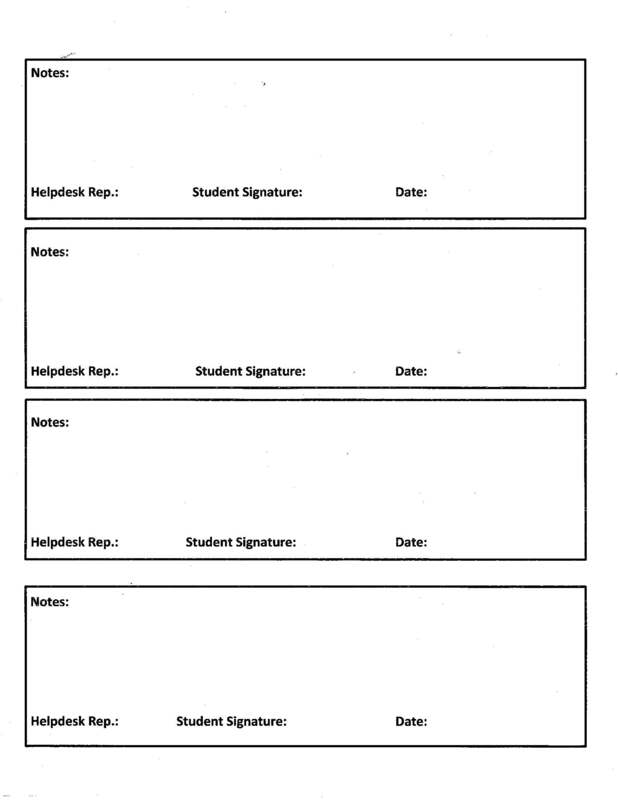 The pages must also have the student signature and student number at the bottom of the pages. Ensure all signatures and dates filled out. Supplemental items can be added if a student needed (ie. mouse) on the last page under additional Notes. For the power adapter just as the laptop put a checkmark next to it to signify it was an item that was signed out. 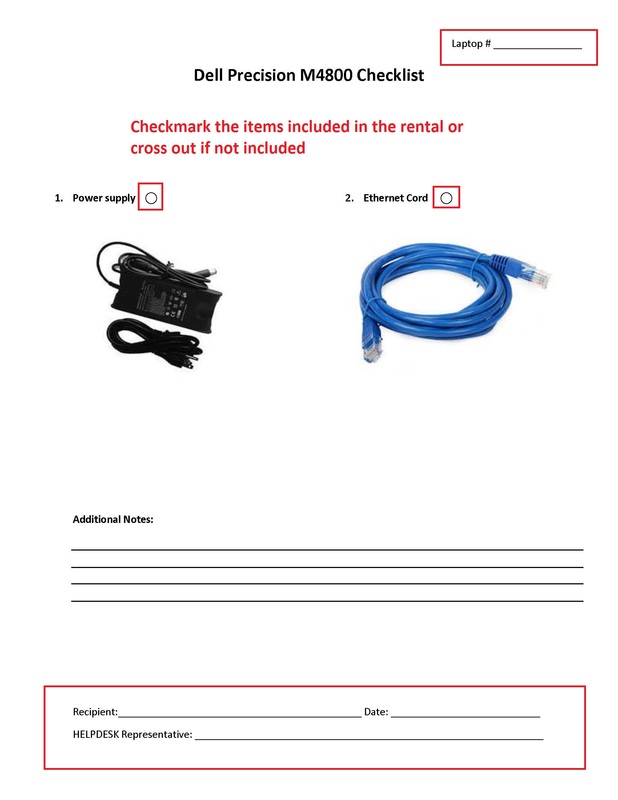 If the student chooses not to include a supplemental item for an item shown on the page (such as an Ethernet cord). Cross out the item and initial next to it. 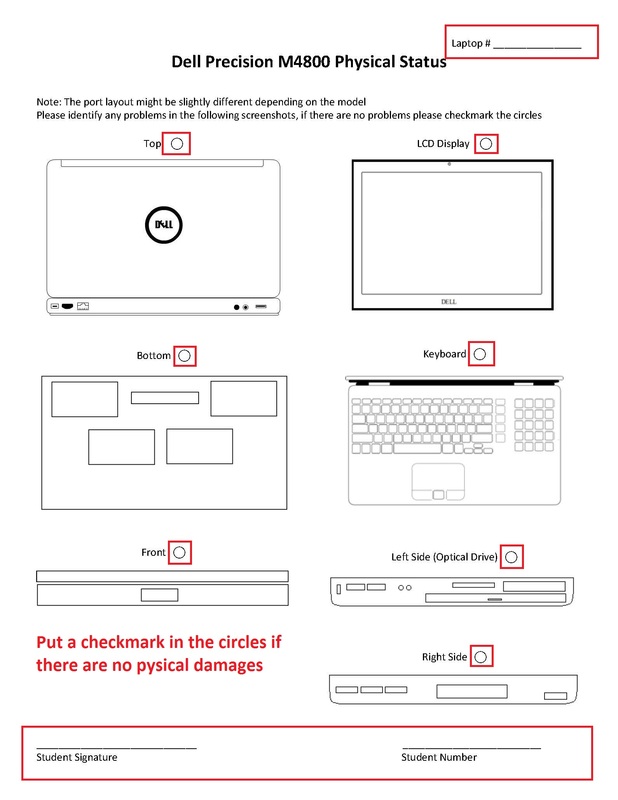 Things to check when laptop is returned. Dents/scratches – signs of a drop. Ports are clean of any residue. Nothing has been spilt on the keyboard, feel over the keys and make sure they don’t stick or have any residue between them. Make sure the power cable doesn’t look frayed at the joints. 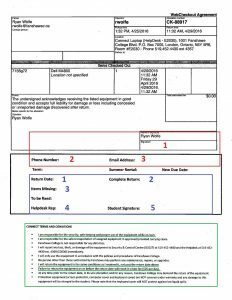 Please see below for images of the above forms. Laptops must be returned to us on the day that they are due. Late fees are $25 + HST per day. If you require the laptop loan for a longer duration, you are required to notify us in person by visiting the IT Service Desk in room E2030 of the Main Fanshawe Campus with the Laptop. The ITSD can, upon its sole discretion, extend the laptop loan. In order to do so the student must provide proof the system is still in repair if being done by a 3rd party. If a laptop has suffered damage, the student is solely responsible for the cost of repair to the laptop. Costs will be determined by an authorized service center, and an official receipt will be presented to the student.